I'm going to start off this post off with a bit of a confession, I'm no surfer chick - dancing to the Hawaii 5 0 theme tune is about as close as I'll ever get! I prefer my waves to be calm and peaceful, just give me a sun lounger rather than a surf board any day! When it comes to supporting a fellow North East company though, I'll make an exception, and start visualising crashing waves, and whipping winds! Named after one of the most popular beaches in the North East, Tynemouth's Longsands. Longsands is a surf clothing and apparel company, based right here, in this fabulous region, that I call home. Don't think wet suits, and bright and gaudy Hawaiian shorts though Longsands in a way parody the traditional idea of pre and post surf apparel and have a designed a range of clothing that's ideal for walking along a cold, windswept, northern beach, rather than along a tropical one lined with palm trees. Designed and printed right here in the UK, Longsands offer a wide, and ever changing range of surf inspired casual clothing and accessories, for men women and children. Although I'm no surfer, I am partial to casual and comfy clothing so many moons ago when I was offered the opportunity to chose a few pieces from the brand, I jumped at the chance. The first product that I chose was something that unfortunately no longer seems to available, it's a t-shirt in a thick feeling fabric, with just a hint of stretch to it. This is a women's t-shirt and this particular one had quite a skinny t, feel to it. It's grey marl in colour and features printed dark, almost black, navy blue wording "Skint and Hopeless" on the front. Although it's caused a few raised eyebrows here and there I love it. At the time I chose the shirt, that was exactly how I was feeling, but now I look at it and see how far I've come, and view it as a bit of a joke. It also features a small Longsands logo on the bottom of the shirt. I think what struck me most about this t-shirt is the quality. As I said the fabric seems quite thick compared to a normal shirt, and it actually feels as though it would last. Mines been through the wash about 6 times now and it looks no different to when I first received it. It's kept it's shape and it hasn't faded or pilled. This t-shirt was £18 when it was originally on sale, not the cheapest shirt ever,but because of the quality I think it was great value. 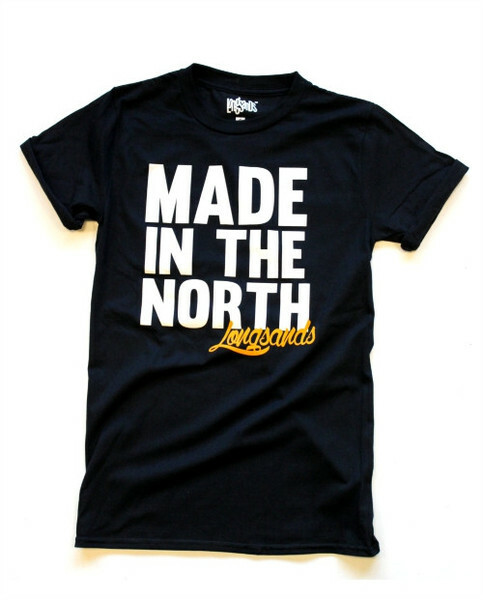 There are several more t-shirts available on the site in various designs but if I had to pick another one I think it would be this " Made In The North" design which again £18. Something that Longsands seem to do a lot of is hoodies. Immensely practical either for throwing on after a swim in the frigid North Sea or for snuggling into in front of the fire, even Kimmy K has been spotted recently in a hoody! Longsands do a huge variety but I fell in love with their retro design. Made of a cotton and polyester mix, this hoody has a thick and heavy feel, with a dark grey, marl, body, it features a navy blue hood navy blue sleeves. It also features a white draw cord and a contrasting white zipper. It also features one of the Longsands logos, the crossed board symbol on both the back and the front. Although I normally like my clothing to be quite form fitting, and dare I say it clingy, with this piece I wanted something different so I sized up. For me this hoody is all about comfort and whilst sizing up doesn't maybe show it off at it's most flattering I'm sure I'll be reaping the rewards come winter time, curled into my hoodie while the winds, howling outside, a steaming cuppa in hand. This isn't a piece that you can really dress up so I just went for a simple tonal Breton style top, some matching Converse and my trusty dark skinnies. Again what is apparent is the quality of the product and the quality of the materials that they use. This is sturdy piece that you would certainly expect to last. The Longsands Navy Retro Hoody retails at £34 and goes from a size S to a size XXL. If you search for it you probably could find a similar looking piece on the high street but and the big but is, would it be the same quality? I'm not sure that it would.